Inspired by the panoramic views of the Atlantic and Alain Allegretti's Mediterranean heritage, Azure is designed to evoke the luxury of the palatial Belle Époque hotels along the French Riviera and the fanciful post-war modernism of Italian architect Gio Ponti. The entry lounge includes custom, larger than life vases clad in glass mosaic tiles suggest the over scaled pattern and sense of playfulness that runs throughout the design of the space. 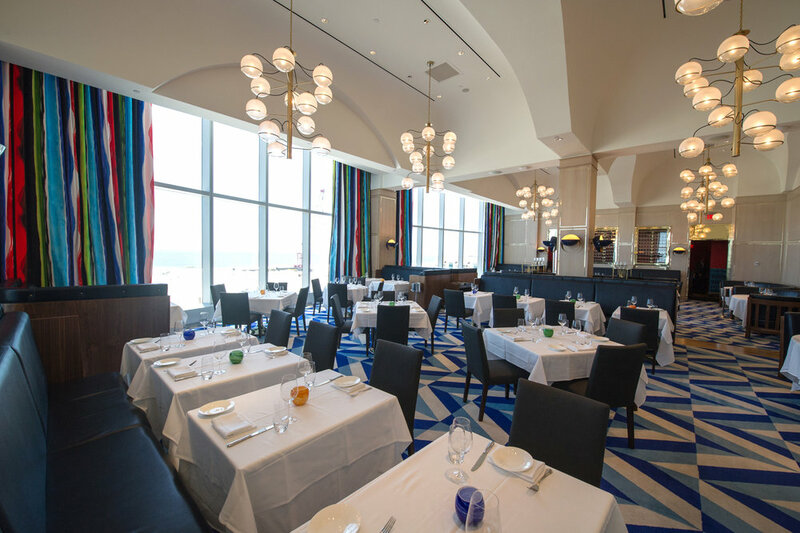 Adjacent to the entry lounge, the main dining area features soaring, 18'-0" high vaulted ceilings and expansive views of the Atlantic coast. Surrounded by pickled French oak wall panels with inlaid brass trim, guests enjoy views of the ocean and boardwalk on one side, or into the exhibition kitchen on the other. Custom chandeliers inspired by 1960's Italian design are suspended above to create a sense of intimacy and wonder overhead. Upholstered in navy blue leather, the custom banquette sofas and dining chairs feature softly radiused walnut backs suggesting the fluid curves and movement of a luxury yacht. Influenced by Ponti's playful use of pattern and color, the custom carpet features three different geometric patterns rendered in white, cobalt and sea foam colors and exaggerated in scale to contrast with the formality of the interior architecture. Views along the window wall are framed by dramatic drapery panels featuring a painterly print of saturated colors designed by Christian Lacroix. The private dining room beyond is entirely finished in bright vermillion hues. 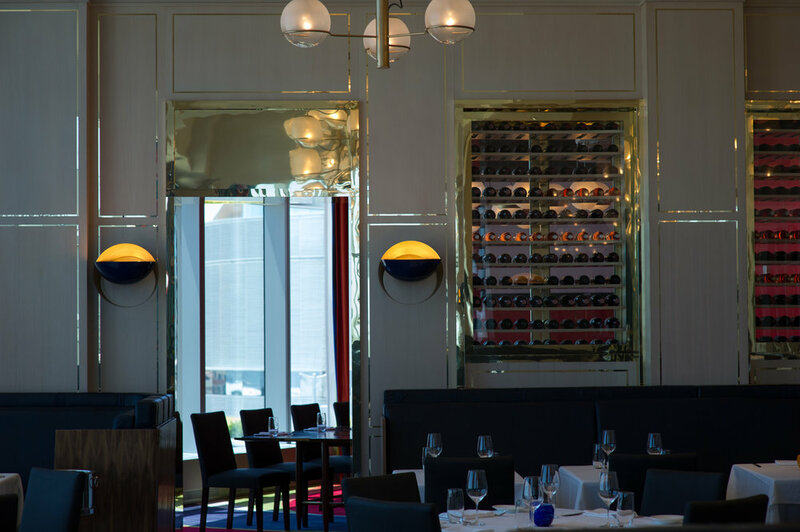 From the aniline-dyed French oak wall panels, to the woven wall-paper on the floating ceiling, the window treatments and the upholstery on the custom dining chairs, the room is defined by this single, restrained gesture. Designed specifically for this space, the custom, hand-tufted carpet is an explosion of lively color inspired by Emilio Pucci's flamboyant geometric prints.